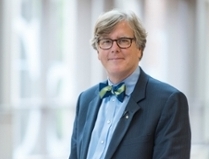 UNCW Watson College of Education Dean Van Dempsey has received the 2018 Distinguished Leadership Award from the UNC Chapel Hill School of Education. 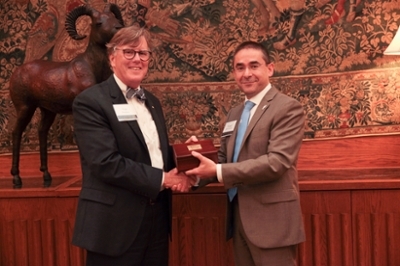 The award was presented at the 17th annual Alumni Awards Dinner held Oct. 6 at the George Watts Hill Alumni Center in Chapel Hill. Dempsey was honored for his passion for public education and for innovation and leadership in the preparation of educators. Fouad Abd-El-Khalick, dean of the UNC School of Education, cited Dempsey’s work in assembling a broad group of stakeholders to create a rich learning environment for children at UNCW’s new lab school at D.C. Virgo; his many years partnering with public schools in North Carolina and West Virginia to enrich university teacher education programs; and his leadership roles in state and national organizations. Dempsey holds a bachelor’s in education, a master’s in teaching and a Ph.D. in social and cultural foundations from UNC Chapel Hill. He began his career as a high school social studies teacher and spent 24 years in higher education in West Virginia before assuming the role of WCE dean in 2015. At West Virginia University, Dempsey drove the implementation of a professional development teacher preparation model: a five-year, dual-degree program designed to maximize time future teachers spend partnering with highly capable teachers in the classroom. His work with legislative and other state officials resulted in adoption of a new clinical model at 10 public universities that provides students with 1,000 hours of experience in public schools. The statewide partnership has resulted in more than $15 million in state and foundation funding since its inception in 2001. At Fairmont State University (WV), Dempsey was vice president for Institutional Assessment and Effectiveness, where he oversaw the assessment of learning and academic programs as well as the evaluation of strategic initiatives and organizational effectiveness. He also served as Fairmont’s dean of the School of Education, Health and Human Performance. Dempsey was a founding member of the board of directors for the National Association for Professional Development Schools; a member of the executive committee of the National Network for Education Renewal; and chair of the West Virginia Commission for Professional Teaching Standards. In 2017, he was one of 16 individuals appointed to serve on the Professional Educator Preparation and Standards Commission, created by the NC General Assembly. In 2018, he was elected to serve on the board of directors of the Public School Forum of North Carolina. His two-year term began July 1.